Bacardi has unveiled a Facebook competition to promote responsible drinking, offering entrants the chance to attend a luxury party in Mallorca hosted by tennis star Rafael Nadal. 'The Champions' Party', is being hosted by Nadal as part of his role as the rum brand's global social responsibility ambassador. It will be held at Castell de Manresa, a luxury villa on Nadal's home island of Mallorca, Spain, in July. The tennis player has helped to organise the entertainment, food, music and drinks for the one-off Balearic island event. Legal drinking-age consumers can enter the 'Mix with Rafa' competition via the 'Champions Drink Responsibly' Facebook page by answering three questions relating to responsible drinking behaviour. The competition closes later this week on 18 April. Meanwhile, Bacardi has also unveiled a new T-Sign app aimed at encouraging its 800,000-strong Facebook community to upload images of themselves and their friends replicating the ‘Time Out’ hand sign. The best photos will be featured on the T-Sign gallery on Facebook. 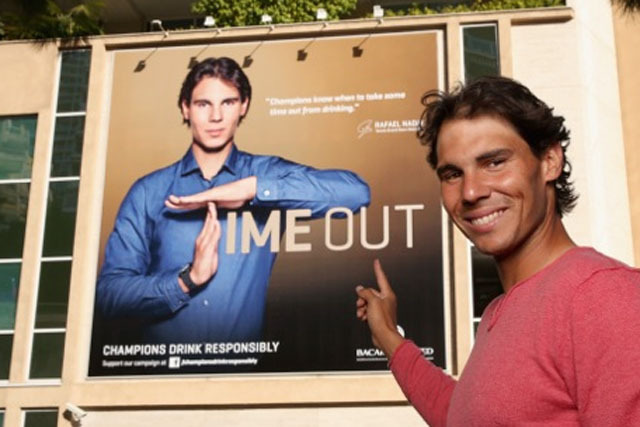 Nadal is also featured using the gesture in the latest Bacardi advertising campaign. Mark de Witte, the business unit managing director with responsibility for initiative in Europe, said: "We are convinced that together we can communicate the importance of responsible drinking to legal drinking age consumers around the world."